The highlighted code (green background) is missing spaces because the empty spaces are generated in these PDF files with offsets. 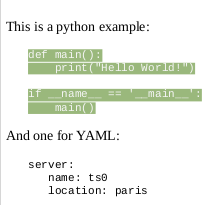 Copy and paste results in ugly formatted code for many languages, but for programming languages like Occam and Python and for configuration files in YAML, this actually changes the meaning. 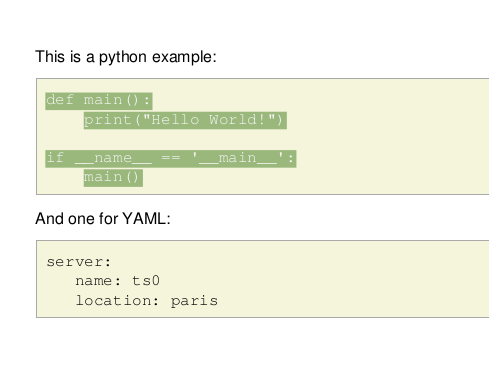 If you are lucky that actually breaks things and you notice, but the YAML example e.g. is also correct without the spaces at the beginning of the line, it just has a different meaning. This space-mangling-in-code-examples also happens in the PDF documents generated by the readthedocs site. and view the resulting one page file, you can copy and paste the code correctly. If you convert that example.epub with calibre (version 2.55.0) via its user-interface you get a PDF file from which you can correctly copy the code (with spaces), but the resulting PDF consists of 3 pages. results in a rendering exception, adding the --old-pdf-engine option the conversion works, but you still have a 3 page PDF instead of a single page. , but when pasting there are no spaces for the indent, and even the space between Hello and World disappears. Apart from that on larger files you get pagebreaks at unwanted places and the layout would need extensive tweaking via style sheets. I tried conversion via .odt but that ended up in PDF files with completely unselectable text. are there any command line tools to generate a PDF file, starting with a .rst file or some other mark-up format? to generate a PDF which preserves the leading spacing of the source. The special ps2pdf option makes it use the content portion of the intermediate PostScript verbatim, leaving well indented text objects in the PDF. You can verify that by opening it with a plain text editor; the content portion is somewhere towards the end. However, then it still depends on the PDF viewer whether it discards those leading spaces or not. E.g., evince as well as old acroread do, and they don't let me select the leading whitespace in the viewer. This is the same also if I replace the spaces with non-breaking space (of ISO-8859-1). Thus, the pipeline does as much as you can do into the PDF file, and then you need to find a viewer that honours the spacing. Not the answer you're looking for? Browse other questions tagged pdf conversion markdown restructuredtext or ask your own question.